So basically I just started off with grabbing a die from the new 'Katharine Cutaways' from Winnie and Walter and die cut the smaller frame from that set using some Neenah Solar White cardstock - my absolute favourite! 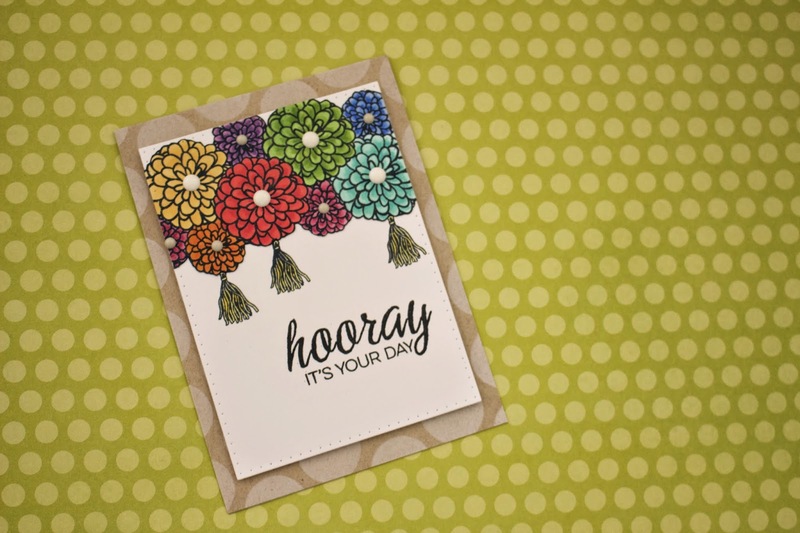 I then started stamping the flower-y image from 'The Party' by Winnie and Walter stamp set on top of the card stock. I used post it notes to stamp the images also to create a mask, it so looks like some are stamped behind others & they don't overlap. I then also grabbed the tassel image from the set and stamped that three times, as it looked a little bare. I then coloured them all in with different coloured copic markers, I'll list them below. Once I did that I used some Versafine Onyx Black to stamp the sentiment from the same stamp set. Once I had done that I grabbed a cardbase made from Neenah Desert Storm card stock and used my 'Extra large dot' stencil by Simon Says Stamp and also the Simon Says Stamp white pigment ink and used a mini ink blending tool to blend some white ink over the dot stencil to create the background. Thanks for stopping by today & I'll be back soon!